A bathroom remodel is a very exciting project. A bathroom remodel is a very exciting project. Your bathroom is one of the most frequently used rooms in your home, so you will want to make sure it is perfect. Before you call in those designers and contractors, though, there are a few things you will want to think about first. How much space does your family need? Do you generally prefer to take baths or shower? 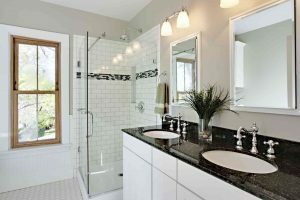 What style, colors and features are you interested in seeing in your new bathroom? Many larger master baths have both a shower stall and a tub. If you have small children, a tub is usually easier for you to bathe them in. And, don’t forget those hand-held showers which makes it easier to wash pets and wash-down the shower walls. Larger families tend to benefit from bathrooms with multiple sinks, which come in handy when everyone is trying to get ready at once. It may be helpful to consult your whole family and make a list of the things that do and don’t work in your current bathroom and to come up with a list of requests for your new bathroom – like individual drawers for each family member for personal items. If you plan to be in your current home for many years, consider adding features that will help as you age. Built-in shower seating is a very popular option. You can also consider installing hand rails to assist with getting in and out of the tub. Even if you’re not ready for them yet, you can still use them to display decorative towels or at least prepare behind the new walls for future support. Make a list of everything that you will be doing to improve your bathroom. If you’re just replacing some fixtures, you really don’t need much of a budget. If you’re gutting the existing room and starting from scratch, your budget will be considerably larger. When hiring a professional, determining a budget is helpful for the design process to move forward and more efficiently toward the final project. This entry was posted on Friday, September 15th, 2017 at 2:42 pm. Both comments and pings are currently closed.